In five illustrated episodes, this new beginning chapter book introduces the residents of the apartment building at 24 Sprout Street. 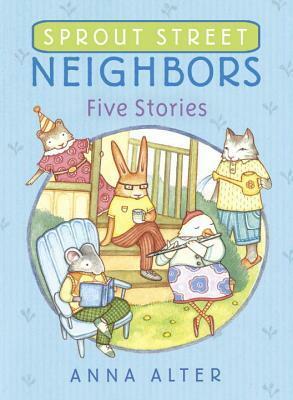 Readers meet introverted mouse Henry, sweet squirrel Emma, self-conscious rabbit Fernando, artistic chicken Violet, and nature-loving cat Wilbur. Each story places one of these characters at the center of a problem which the other neighbors help to resolve using their unique skills and their empathy for one another's difficulties. This is an ideal book about friendship for both preschool and early elementary audiences. For younger kids, it is an engaging read-aloud, filled with lots of interesting personalities that come to life through lively dialogue. For newly independent readers, it presents some challenging vocabulary (bougainvillea, marzipan, papier-mache, stupendous, enormous, etc. ), but overall, it is a great bridge book between easy readers and novels, especially for kids who have enjoyed and outgrown series like High Rise Private Eyes, Poppleton, Frog and Toad, and Oliver and Amanda Pig. For both age groups, it provides insight into how to be a true friend in times of trouble, and it demonstrates the way in which each member of a community is able to contribute something to the greater good. Few beginning chapter books are set in apartment buildings, so it is great to see something new and different, and the setting and format of the book work well together to help readers feel the neighborly camaraderie that exists among the characters. The inclusion of common household problems, such as leaks and noisy neighbors, also engages kids' interest in the happenings of the grown-up world and might even spark a connection between the story and something that has happened in their own homes. For urban kids, especially, it will be neat to see their own living arrangements mirrored in the lives of these animals. The Sprout Street Neighbors will appeal to parents seeking wholesome reading material for their young readers, as well as to kids, who will fall in love with the characters and eagerly enjoy their funny, surprising, and touching adventures. This book is only the first of what will hopefully become a sizable and beloved series. I recently discovered your sweet review and wanted to thank you for your kind words. It is great to hear you feel the book will be useful in classrooms- my hope is that it might foster empathy and camaraderie in some small way. Thanks also for the Cybils nomination!